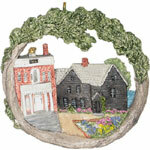 The handpainted Salem AmeriScape ornament is atombstone-shaped and depicts a witch flying over the Salem Common. Made in Massachusetts by Hestia Creations. Dimensions 2.25" x 3.25" H.